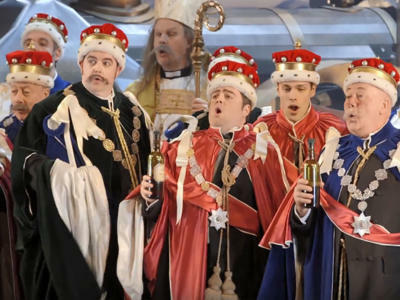 Gilbert & Sullivan’s hilarious operetta Iolanthe is a satirical fantasy. Phyllis and Strephon wish to marry, but as Phyllis is a ward of court she requires the Lord Chancellor’s permission. The Lord Chancellor, however, wants her for himself. Featuring a melodious score and brilliant wit, Iolanthe not only targets peers of the realm and the British system of government but also offers thinly disguised portraits of Queen Victoria and William Gladstone (Liberal PM of the day). Twenty-five years ago, the fairy Iolanthe married a mortal – a capital offence under fairy law. However, her sentence was commuted from death to lifetime banishment on condition that she leave her husband and never see him again … but not before she manages to have a son, Strephon, who is half mortal and half fairy. Now grown up, Strephon is a shepherd and has fallen in love with Phyllis, a shepherdess. She remains ignorant of his origins. 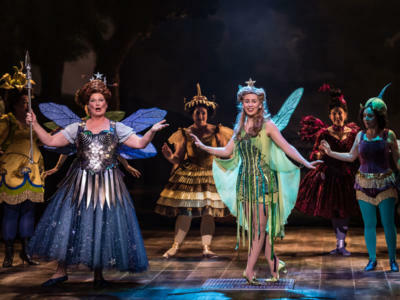 The fairies still miss Iolanthe and plead with their Queen to bring her back from exile. The Queen of the Fairies, unable to bear punishing her any longer, recalls Iolanthe and all rejoice at the reunion. 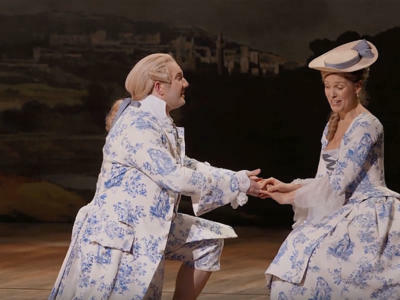 Strephon announces his intention to marry Phyllis – though, as she is a Ward of Chancery and therefore under the protection of the Lord Chancellor, she will need his permission to do so. 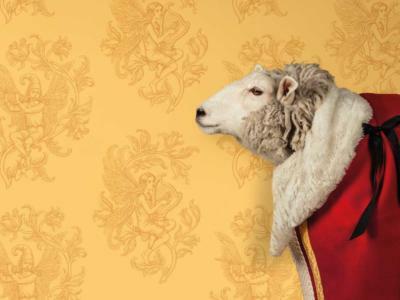 Strephon has approached the Lord Chancellor: as he does not regard a mere shepherd as a suitable husband for Phyllis, he has withheld his consent. Before she departs, the Queen promises Strephon her assistance. Phyllis and Strephon are reunited; despite the obstacles they face, the lovers recognise they can delay no longer. The Lord Chancellor and members of the House of Lords enter in grand procession. The peers are all smitten with Phyllis, and have appealed to the Lord Chancellor to decide which of them shall have her hand in marriage. The Lord Chancellor has not been immune to Phyllis’s considerable charms but, as her guardian, hesitates to take her for himself. The lords summon Phyllis and invite her to choose one their number; she, however, declines to marry any of them. When they discover it is Strephon who has captured her heart, the peers make a dignified withdrawal, amused by her choice of such a low-born individual. The Lord Chancellor once again turns down Strephon’s request for Phyllis’s hand in marriage. Distraught, Strephon turns to his mother for comfort and advice. When Earls Tolloler and Mountararat, together with Phyllis, see Iolanthe and Strephon in a warm embrace, they jump to the wrong conclusion. 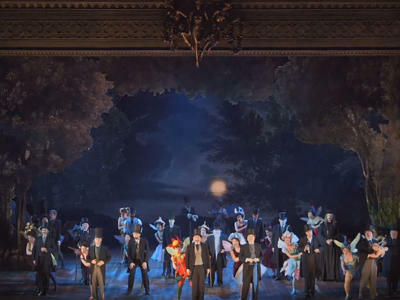 As Iolanthe’s appearance is that of a young woman (fairies do not age beyond early adulthood), the earls ridicule the claim that Iolanthe is Strephon’s mother, and Phyllis rejects Strephon for his apparent infidelity, impetuously declaring that she will marry either Tolloler or Mountararat. Strephon calls on the Queen of the Fairies to come to his aid. Infuriated by the peers, the Queen declares that Strephon will enter parliament and, backed by her authority, will have the power to pass any bill he proposes. The peers’ authority will be crushed. While on sentry duty, Private Willis muses on the vagaries of political life. The fairies goad the peers about Strephon’s parliamentary career. He is currently advancing a bill to throw open the peerage to competitive examination. The lords seek the fairies’ help to end Strephon’s meddling in the parliamentary status quo. Despite having become much attracted to the peers, they cannot interfere in Strephon’s actions as he is under their Queen’s protection. On learning that the fairies are falling in love with the peers, the Queen of the Fairies is outraged and reminds them of the punishment under fairy law for marrying a mortal. Looking at Private Willis, she claims that she can easily subdue her natural response to his manly good looks. Unable to decide whether to marry Tolloller or Mountararat, Phyllis leaves the choice to them. With the real possibility of a duel to the death, the two peers realise that their own long-standing friendship is far more important to them than marriage to Phyllis, and they renounce their claims to her. The Lord Chancellor enters, dressed for bed. He is plagued by insomnia caused by his unrequited love for Phyllis. Even when he does manage to sleep a little, he explains that his rest is disturbed by terrible nightmares. Tolloller and Mountararat sympathise with his predicament and urge him to consider marrying Phyllis himself. Strephon’s considerable parliamentary successes – he now leads both political parties – are of no consolation to him: he is miserable at having lost Phyllis. When he sees the shepherdess, he tells her that his mother is the fairy Iolanthe – thus explaining her apparent youth. The reunited lovers entreat Iolanthe to intercede with the Lord Chancellor on their behalf– at which point Iolanthe has to reveal that the Lord Chancellor is in fact her husband and Strephon’s father. The Lord Chancellor believes Iolanthe to have died childless and, despite her love for him, she is bound under fairy law not to allow him to see her. However, she agrees to appeal to the Lord Chancellor, with her face being covered by a veil. Though moved by Iolanthe’s plea, the Lord Chancellor nevertheless declares that he will marry Phyllis. In desperation, Iolanthe removes the veil to expose herself as his long-lost wife, and Strephon his son. She has again broken fairy law and the Queen of the Fairies has no choice but to punish her with death. 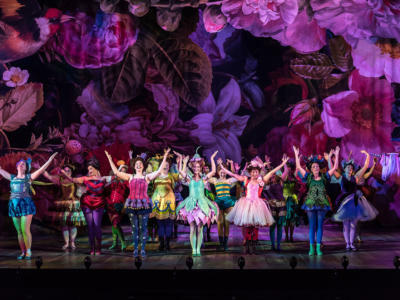 As she prepares to carry out the sentence, the Queen learns that the other fairies have chosen husbands from among the peerage, thereby incurring the same punishment as Iolanthe. The Lord Chancellor has a expedient solution: by inserting a single word, the law can be altered so that it now reads: ‘every fairy shall die who doesn’t marry a mortal’. To save her own life, the Queen must marry at once and chooses a mortal for herself, before peers and fairies alike go off to Fairyland.